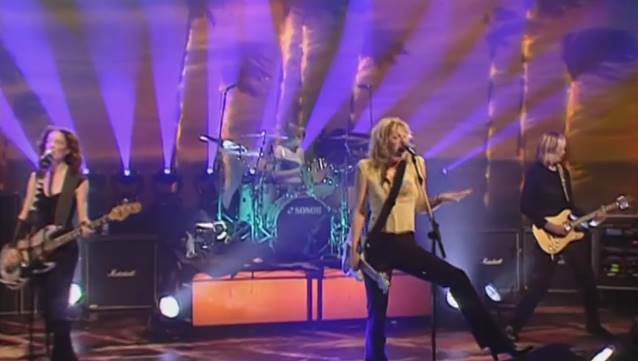 According to The Pulse Of Radio, the speculation appears to be true, Courtney Love is once again reuniting the "Celebrity Skin" lineup of HOLE. Late last year, Courtney posted a photo on Facebook of her hugging on guitarist Eric Erlandson and tagged bassist Melissa Auf der Maur. The caption for the photo read, "2014 is going to be a very interesting year." That lineup, also featuring drummer Patty Schemel, will release a new single titled "Wedding Day" in May to coincide with a U.K. tour. When speaking about the reunion, Love said, "I started playing with Patty and Melissa and Eric, just to see how that was. We already played like three or four times in the last week." They played together from 1994 to1998, between the arrival of Auf Der Maur, who replaced the group's late bassist Kristin Pfaff, and the departure of Schemel, who left the band over differences with the "Celebrity Skin" producer. The lineup played its first songs together in 15 years — "Miss World", off "Live Through This", and a cover of THE WIPERS' "Over The Edge" — in April 2012 at an after-party for Schemel's documentary.